Back in the summer of 2013, our founder, Marina Seevak, took action on an idea she’d been dabbling with for years. She got a cubicle at the Artisan’s Asylum, a Boston area maker space, and sent out hundreds of blind emails to local manufacturers to see if they would be willing to save their industrial scrap for her. Marina knew this kind of scrap was actually treasures to teachers and she wanted to make it available to her community by starting a small creative reuse center. Her first job out of college over 30 years ago was at the Boston Children’s Museum where she was introduced to the RECYCLE Center. 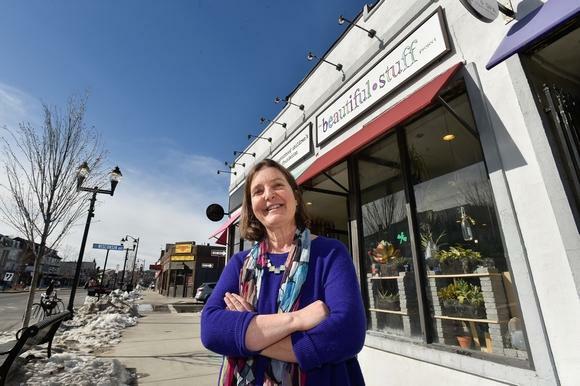 When she started teaching in the Cambridge Public Schools she was a frequent customer at the RECYCLE Center to stock the ever popular “junk” center in her first grade classroom. Marina started to receive some positive responses from places willing to get on board and save their excess and scrap. Within a couple months, the cubicle at the Artisan’s Asylum became a busy place. With barrels full of colorful foam scrap from Rogers Foam Company, sparkly fabric remnants from Costumeworks, sticky adhesive rubber from Greene Rubber Manufacturers, rectangular cardboard boxes from Solectria Renewables, glorious glass square inch tiles from Artaic Mosaic Design….teachers came and were ecstatic. In those days, TBSP was truly a labor of love. Marina bartered for the space at Artisan’s Asylum by helping them with their educational programs for children and she did all the outreach, pick-up, and organizing of materials by herself. She gave away bags of materials for free to local teachers. She was a teacher helping teachers, not a business woman. When the summer turned into Fall and the new school year began Marina moved the operation to a storefront in East Somerville. She hired her first, very part time staff, James Holton Fox, and the two of them ran the whole show still giving away bags of materials for free and running drop-in open studios to model ways of using the materials. Simultaneously, Marina asked a kindergarten teacher she knew in the Somerville Public Schools if she could use her class as a “guinea pig” to try out some curriculum she was developing with the materials she was collecting. She showed this teacher one of her “treasure boxes” and explained that she wanted to let students play freely with the materials. The teacher was skeptical and much to her surprise, her students could not get enough. Marina knew she was onto something. Only weeks into her work in that first classroom, the teacher across the hall asked if she could come to her classroom. Then the teacher down the hall. Before long, Marina was all over the school & began getting requests from other schools. This growth was completely teacher-driven and based only on direct requests. In order for The Beautiful Stuff Project to stay viable, we need continued community support. Although the passion for our work remains strong, we can no longer operate as a labor of love. We have rent and salaries to pay. Stop by during our open hours and buy a bag of materials or pay for a drop-in studio activity. Register yourself or your child for one of our workshops or vacation programs. Help us source new & interesting materials from companies, manufacturers, stores, artists, and individuals. We depend on a regular flow of new materials and we need help in all aspects of this endeavor. Make a financial donation. Pay more for a bag of materials or open studio. Or just press the donate button on this website or send us a check made out to The Neighborhood Children’s Foundation. Volunteer your time. We always have jobs to do in the storefront to help keep the space organized and inspiring.